These are not the most elegant words to describe this but after reading the blog of Serena Williams on GlobalGrind.com, all I can say is "wow" and "dang". It was originally reported that she was fined $82,000 for the U.S. Open incident but she unveils that it was actually $92,000. The largest fine in Tennis history. Are you serious? Ok, that's not all I can say because I am about to blog more about it right now. Let's get right to the point. I am not a sports analyst nor a sports historian and I rarely even put sports related news on my blog. But Serena has reached what she calls "her boiling point". Some of us have too in our own little ways with what goes on in this country and our communities. Some of us just choose to talk about it while others choose to do something about it. Serena is about to do something. As I read the blog, I noticed she used code words to call out "others" who have historically done worse than what she did at the U.S. Open and was fined significantly less. "Everything seemed to have surfaced. As you know, losing my cool cost me over 92 thousand dollars. 92 thousand dollars! This is more than most people make in a year. 92 thousand dollars! Answer this: Why is it another player who also lost HIS cool not to a line judge - like I did - but to the main officiating judge- using the same "f word" why was HE only fined 10 thousand dollars. Was what I did 10 times worse than what he did?! There is another HE who was fined less than half of what I was fined after someone in his camp actually physically ATTACKED an official!!!! What about the famous HE who made arguing with officials "cool". Cool for "MEN" I guess. Is it because they are all HE's and not a SHE like me?" Ok, she won't say it but I will. The HE she is speaking of is a bunch of White male tennis players. As if you didn't know. So, Serena it's not just because you're a SHE it's because you're BLACK. But I could be wrong. I commend her for bringing balance to her blog by stating, "I don't mind being fined. If I did wrong I accept the repercussions. All I ask for is to be treated equal." "When I was fined the 92K, I asked to see if I could donate some of it to different schools, and programs I'm involved in. My request was denied. So, I decided to match the fine by raising money and donating an additional 92K to my 2nd school that I am opening up in Africa, as well as to schools that I am helping here in the United States. I also want to educate women about what I learned from this whole experience. How we as women are still treated as less than equal. I am going to turn this 92K into a positive!!! And I have decided to call it Serena's 92K mission!!! Go to Serenawilliams.com to learn more about my 92K mission." Now, that's how you turn a negative into a positive. Kill'em with kindness. Thank you Serena Williams and I will support your mission. I am not a big tennis watcher but I am a lover of justice. 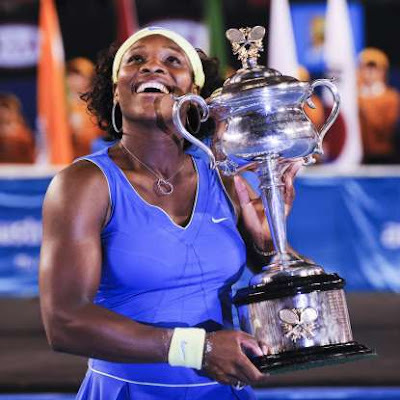 Questions: Did Serena Williams get fined too much? Was this racism? Maan this is horrible! Straight racism! It really is about the fact that she's black, people always forget about the "class" factor in situations like this. I do agree though that the fine was ridiculous, but she turned the negative to a positive buy donating that same amount to a charity. Thank you all for the feedback. So far I guess I am not the only one who thinks this is crazy and race related. I appreciate you all visiting my blog as well. Racism, racism , you can't resist pulling the race card, can you? But then what would a suitable punishment for her be? Because these things occured in the past and people whom she mentions indirectly (McEnroe,Tarrango) WERE PUNNISHED BY A SLAM BAN AND FINANCIAL FINE. So what should she get then? I think your answer would be a free pass,sadly. @Nina Thank you for the comment. I can respect your opinion. But she got the largest fine in history!! C'mon think about it. And the persons you named didn't get close to that fine even with a Slam ban. Let's be real. I am in no way saying she should not have been punished at all but where is the justice in her punishment? Thanks again for sharing your thoughts. And for the record race is still an issue in America regardless how many of us want to think it is not. So I don't have to pull the race card, the deck is laid out before us everyday in the news. Thanks for replying, I'm quite surprised. Yes,racism is in your country as well as in other countries coming from all the races. To address your points: back in the day McEnroe and Tarrango did not earn nearly as much as athletes these days do which is why the fines weren't so high. In addition,once they got a ban they got no chance to even compete for that price money at all whilst Serena was allowed to go on after the incident and win Doha, for example. I think by backing up Serena you are backing up bad behaviour,plain and simple. This isn't about race,be real. It's about a popular and talented athlete acting immaturely (to put it lightely) and making a total fool of herself. But this finger pointing certainly won't win her reputation back. Rather than that she should write all her blog about helping children! Your points are noted. No way am I backing up her bad behaviour. That's why I said previously i believed she should have received some form of punishment. Another example is in the case of the Jena Six. It wasn't so much those boys did not deserve some form of punishment once it was admitted that they beat up Justin Barker. But the problem was the fine didn't fit the crime. Before you go off (smile). These two cases NO WAY compare to one another I was just using the example. I think her fine was excessive but maybe its according to the big Tennis manual I have never read. But lastly, I am not one for long drawn out online debates because I am a lover of work being done offline to make change. So what I AM backing Serena in is her $92K mission to better schools. Because I love speaking in school and helping youth. I am not backing down from my perspective on this but at the end of the day, I like how she is turning it into a positive. Again thank you for the dialogue! Ok Brother Jesse, good luck with your projects and for replying on my posts(this is the last one, dont worry). It's always good to support good causes. Oh and by the way, yes, I'm a mixed raced person and I support community work,too. I enjoyed reading your perspective on this. I think it was obvious to tennis fans (and especially Serena fans) that she had indeed reached her 'boiling point' before the U.S. Open outburst. She was on the brink of losing the Open...an Open she was supposed to dominate. And losing to a player just coming off retirement. 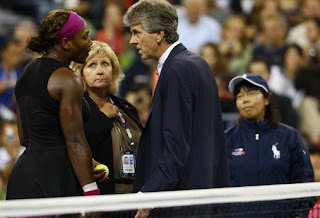 I believe Serena was more upset with herself than with the linesperson....when the foot fault was called, her emotional dam burst and the official was just in the wrong place at the wrong time. Honestly, I do not think the reaction of the media or the USTA was over-blown. Serena has always been extremely tolerant about poor officiating and 'blown calls'. She is seen as the 'face of women's tennis' and I believe this uncharacteristic outburst caught us all by surprise. Serena has always been highly respectful of the game and we were all shocked at her 'losing it' in this situation. As a former athlete, I can fully understand her frustrations and although I cannot condone her behavior, I can certainly empathize with what transpired in the heat of the moment. I was glad that she apologized and it appears that the tennis fans and public have accepted this apology and deemed this outburst an aberration. As far as the fine being out of proportion....I really don't think so. As stated previously, Serena is the face of women's tennis and by being so, must adhere to a higher standard.I do see your points - but I really don't think this is a case of racism or sexism......her fine was the largest because she is larger than the sport.....and because of that she has to bear a heavier cross of responsibility. I think this episode shows that Serena is a human being with emotions and passion. I believe she will put this situation behind her and continue to be the strong, intelligent,inspiring athlete that we all admire.